Helped building 100 hand-held convolver for the 20th anniversary of the Red Bull Music Academy. Designed and tested the hard/software of a prototype that delivers directional haptic cues to your hand to augment VR. The sound_field_analysis toolbox is a Python port of the SOFiA toolbox for Matlab. It allows you to analyze, visualize and process sound field data recorded by spherical microphone arrays. A mixed, array-based speaker system, where traditional LSFI beamforming and path estimation are simultaneously employed in their respective comfortable frequency range. A method of generating musical waveforms which relies on sampling a variable polygon in polar space with a rotating phasor. Interactive AV installation for ZHDK's Immersive Lab installation, featuring 360 deg projection, multi-user interaction and 16 channel spatialisation. M4L implementation for interfacing the SoundScapeRenderer (http://spatialaudio.net/ssr/) network adaptor. Investigated the perceived coloration of a synthesized point source presented by stereophony and Wave Field Synthesis using between 14 and 3584 speakers. 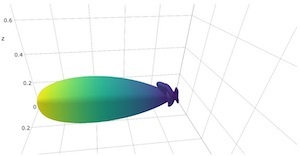 Ma, Xiaohui and Hohnerlein, Christoph and Ahrens, Jens (2018) Listener-Position Adaptive Crosstalk Cancelation Using a Parameterized Superdirective Beamformer. IEEE 10th Sensor Array and Multichannel Signal Processing Workshop (SAM 2018), Sheffield, UK. SJ Keller, TT Trutna, R Mehra, CO Hohnerlein, E Gatti (…) - Haptic surface with damping apparatus. Oculus VR LLC. US 9851799 B2 (granted 26/12/2017). Hohnerlein, Christoph and Rest, Maximilian and Parker, Julian (2017). Efficient anti-aliasing of a complex polygonal oscillator. 20th International Conference on Digital Audio Effects (DAFx17), Edinburgh, Scotland. Ahrens, Jens and Hohnerlein, Christoph and Andersson, Carl (2017). Auralization of Acoustic Spaces Based on Spherical Microphone Array Recordings. The Journal of the Acoustical Society of America Vol 141, Boston, USA. Hohnerlein, Christoph and Ahrens, Jens. Perceptual evaluation of a multiband acoustic crosstalk canceler using a linear loudspeaker array. IEEE International Conference on Acoustics, Speech and Signal Processing (ICASSP 2017), New Orleans, USA. Hohnerlein, Christoph and Ahrens, Jens (2017). Spherical Microphone Array Processing in Python with the sound_field_analysis-py Toolbox. Annual Meeting of the German Acoustical Society (DEGA), Kiel, Germany. Hohnerlein, Christoph and Rest, Maximilian and Smith, Julius O. (2016). Continuous Order Polygonal Waveform Synthesis. International Computer Music Conference (ICMC), Utrecht, Netherlands. Mehra, Ravish and Hohnerlein, Christoph and Perek, David and Gatti, Elia and DeSalvo, Riccardo and Keller, Sean (2016). HapticWave: Directional Surface Vibrations Using Wave-Field Synthesis, ACM SIGGRAPH Emerging Technologies, Anaheim, USA. Wierstorf, Hagen and Hohnerlein, Christoph and Spors, Sascha and Raake, Alexander (2014). Coloration in wave field synthesis. Audio Engineering Society (AES) Conference: 55th International Conference on Spatial Audio, Helsinki, Finland.